Heroic Action ….. Historic Adventure ………… so says the film’s trailer. Released during the same season as Prince Valiant, this proved to be another film aimed at the youth market featuring plenty of swordplay, heroines in distress, color photography and mindless adventure with a few faces sprinkled into the mix that box office patrons were sure to recognize. Sounds like more than half of the super hero movies released nowadays. Mindless being the key word? You bet. It’s a desert locale where George Sanders in the title role with a little bit less bite in his tongue has his legion of crusaders stationed and readying for war against the unseen forces over the next sand dune in the name of religion. As soon as one sees that two of his closest officers are played by Robert Douglas and Michael Pate, then one should know that evil is lurking over George’s shoulders. Laurence Harvey is also a member of George’s forces and the two will have an odd relationship throughout the film. Harvey is a Scotsman and a supposed enemy of the Brits. Still, he is loyal to George and the two will engage in both verbal and physical battles as this lengthy crusade marches on to the tune of 113 minutes. A large part of their falling out will occur over …… oh, yes, a woman. None other than the beautiful Virginia Mayo who I do believe I’ve often referred to here at Mike’s Take. She’s actually kin to George and he’ll not have her running off with a Scotsman. While the soap opera portion of our film takes hold, Douglas and Pate have a go at assassinating dear George. They nearly succeed with the bow and arrow by ways of skullduggery. The wound is a serious one leaving Sanders lying about for a good half of the film. Enter top billed Rex Harrison as a witch doctor of sorts from the enemy camp of the desert heathens that Sanders wishes to conquer. Rex proves to be a very wise man from the enemy camp whom George takes a liking to despite their religious differences. Harvey just might have some competition for the hand of Miss Mayo once Rex sets eyes on the fair lady. Harrison actually comes off best throughout the film as he keeps it light and playful. Even more surprising as the film goes on is the unveling of his true identity which you won’t find me revealing here. That, you’ll have to discover for yourself. Sanders and Harvey will have to mend their differences as the plot plays itself out to discover just who are the real enemies to Richard’s crown. Paging Mr. Pate and Mr. Douglas to the gallows. Silly and as juvenile as this really is, their is some nice camera work within including a great shot for the demise of one of our leading villains. While David Butler served as director, there is some great second unit work here thanks to the efforts of stuntman extraordinaire, Yakima Canutt. All set to the strings of a score by Max Steiner. While Sander’s tongue isn’t as sharp as it has been known to be, a couple lines seem to suit him perfectly. First, “Never trust a Scot.” I somehow can see George putting any nationality into that phrase and convincing me he just might be serious. The other is when he discovers that Harvey has a woman on his mind and not quite realizing just yet that it’s Virginia, instructs Harvey in the ways of love and also informs him that when it comes to women, “The deeper they claw, the more they love.” Don’t you just love these golden era scripts! No classic to be had here but while watching I couldn’t help but think a stronger lead in the Harvey role might have added to the overall impact. Had the film been done in the late thirties or early forties, Errol Flynn would have been the leading candidate and since there’s never been a Flynn like actor since, it’s hard to come up with an obvious choice. Suggestions? 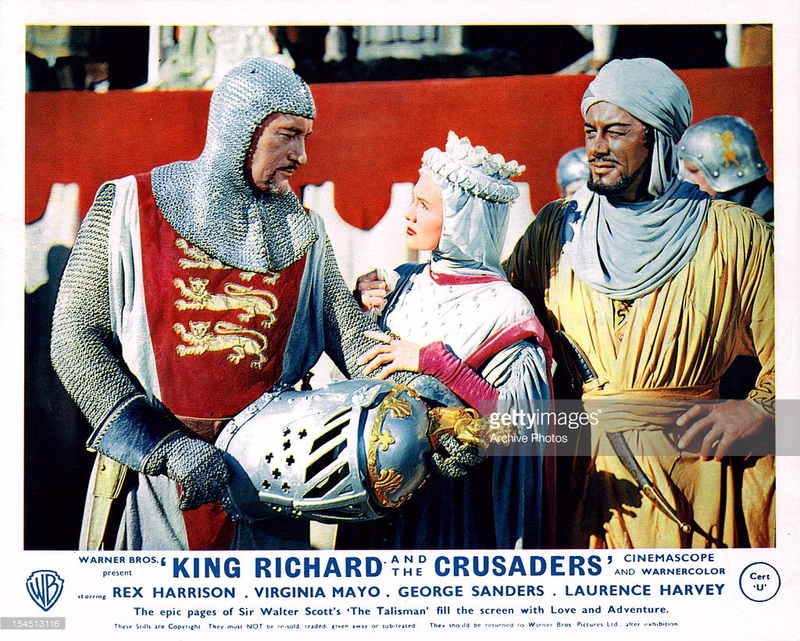 Occasionally seen on TCM, Sanders as King Richard is also available as part of the Warner Archive line if you are so inclined. Whenever I think of swordplay in movies from the classic era, I think of Tyrone Power, especially in ‘The Mark of Zorro’, where he had a great duel with Basil Rathbone. So he’d be my pick, since Errol Flynn is unavailable in your scenario. The battle with Ty and Basil a beauty. Ty might still have worked here but even at this point was getting long in the tooth for this roles. He always looked so much older after the war years than he really was. Most evident in ‘Witness for the Prosecution’, I’d say. Still, he was still doing good work…I wonder what movies he would’ve done if he hadn’t passed away before his time. Once the sixties hit I think he could have fit into the Stanley Kramer titles like Nuremberg, Ship Of Fools and the like if he remained an A budget star. Soap operas etc. I’ve toyed with picking up this movie on and off for a while now so I’m glad you featured it here. Even though I’m a sucker for these historical adventures it sounds somewhat mediocre. I’m still keen to see it but perhaps not quite as urgently. I had it eyed up on the shelf for a while since picking it up. It’s not a memorable feature so the odds of me seeing it again anytime soon are limited while give me a cheesy Tony Curtis sandal epic and I’ll jump right back in. lol. Son of Ali Baba anyone?